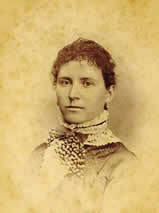 Nancy (Nannie) Alice Kilgore was born in 1863. She was originally from Port Washington, Tuscarawas County, Ohio. She was 4’11” tall. W.P. and Nancy were married in 1884 in Port Washington, Ohio. They met while she was visiting relatives in the Independence area. When she went home, it is said that Mr. Brown followed her and courted her in her home county of Tuscarawas. They were married there in the Moravian Church. About a year later they returned to Independence, Kansas to make their home.